The best cordless leaf blower is lightweight and maneuverable. They are great because they do not require as much maintenance as gas-powered models require. They also free you from the restrictions of the cord found on electric models. You can run a good cordless leaf blower for up to an hour before you need to recharge it or replace the battery. This should give you plenty of time to clear most small to mid-sized yards with ease. There are some brands of blowers that have a reputation for being more durable and reliable than other brands. These brand name products tend to be more expensive, but they also often come with two-seven year warrantees, which is something you won’t find on the lesser well-known brands. This is why selecting a cordless leaf blower with brand recognition is an advantage. Is A Cordless Leaf Blower Right For You? Cordless electric leaf blowers can be lightweight, convenient and affordable, but there are a few things you should consider before purchasing one. These types of blowers are the most effective for clearing leaves from small to mid-sized yards. Specialized tubes can be used to help you carefully blow debris from delicately landscaped areas. If you have heavy debris that is hard to blow or move, you will not be able to use these lightweight blowers for very long without changing out the batteries as the higher speeds tend to run the battery power down quite quickly. Because of the limited amount of battery life on these models, they are impractical for those looking to clear large lawns or those that have a lot of heavy debris. What Should You Know Before Buying A Leaf Blower? Backpack leaf blowers tend to be larger and more powerful than their handheld counterparts. Many of them are gas powered for more blowing force, but there are battery operated models on the market as well. There are many variables you need to consider before purchasing a new leaf blower. Many backpack models are designed for landscaping professionals. If you are a homeowner you may want to consider other leaf blower options, unless you have a large area to clear or one with thick leaves or debris you need to move. Most backpack leaf blowers are powerful enough to double as snow blowers in the winter time, which can be quite useful. Make sure when you purchase a cordless leaf blower that it will have sufficient airflow. This is specified by both velocity and volume. Velocity will be displayed in mph and volume as cubic feet per minute or cfm. Neither of these measures is necessarily a great indicator of leaf-moving capacity. Other factors also influence whether you can obtain sufficient airflow, such as the shape of the discharge tube. Be sure that the tube you get on the leaf blower can efficiently move the leaves and debris you need it to. It needs to be able to direct the airflow in a way that can gently blow away any debris on the landscaping or handle the heavy wet leaves in the backyard. Well-designed tubes are what allow you to use the unit’s power productively so that the sweeping and loosening capabilities are maximized. Nicer units will feature a variable-speed trigger. This can help you adjust the power level so it maximizes battery life while completing each task you need no matter how delicate or challenging. Power dials are useful but are not as adjustable as a variable-speed trigger is. A power dial is still more preferable than a blower that features only a single constant speed. The final things you need to consider when shopping for a cordless leaf blower is how comfortable it is to hold and maneuver. It should be balanced well so you can have maximum comfort while operating the unit. Earplugs and eye protection are necessary when using any kind of leaf blower. While electric models are much quieter than gas models, both types of leaf blowers are capable of causing a long-term hearing loss due to the loud sound they produce. Even quiet models produce up to 65 decibels of sound. Safety glasses are required because no matter what you are using your leaf blower on, small sticks, grass, leaves, bugs, and other debris can easily blow into your eyes and damage them. Safety glasses will help prevent this from occurring. What Kind Of Leaf Blower Do I Need? 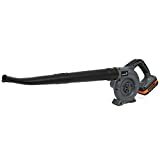 The best cordless leaf blower may be more expensive than corded blower options because you need to purchase rechargeable battery systems to support them in addition to their base cost. Corded blowers do not need gas nor have the expense of rechargeable batteries, but if you decide to purchase one you will need to purchase a 14 gauge extension cord in order to use it. The cord makes them these units less maneuverable than gas or cordless electric models. Gas models are expensive, loud and usually more difficult to maintain those electric models and they are mostly unnecessary for those with a small to mid-sized yards. They have the advantage of an extended operating period without the need to refuel and they feature extremely powerful airflow designs for tackling the toughest or largest jobs. The biggest expense I have found when looking into getting the best cordless leaf blower is the rechargeable batteries and battery charger that I would have to purchase separately. I suggest you look in your toolshed before purchasing a new model to see if any of your other garden tool manufacturers offer a cordless leaf blower that uses the battery system you may already have for some of your other garden tools. Since most manufacturers feature a product line that uses interchangeable rechargeable batteries. If you purchase a leaf blower from the same manufacturer as another garden tool you already own, you may be able to save money because you will not need to buy a new battery or charger to use your new leaf blower. This expense alone could save you a couple hundred dollars less than buying a new battery recharger and a couple extra batteries of two. This article explains the differences between the different types of leaf blowers so you can check to see which one might be right for you. The Ivation 20V Electric Cordless Blower features a powerful 20V 2.Ah Lithium Ion battery. This type of battery is designed to hold a charge for a longer period of time than a NiCad battery. This blower features a sweeper that is capable of producing a 130 MPH airflow velocity. It is a very lightweight and easy to use blower. The scraper at the end of the hose is designed to loosen wet leaves and heavy debris so they can be removed more easily. 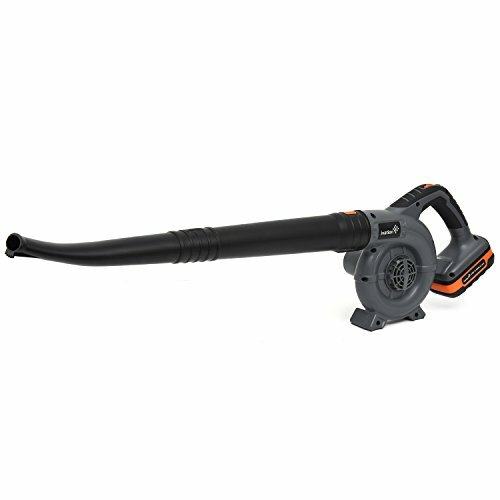 The cordless design and the comfortable built-in handle of this blower make the system highly precise, for speed and ease of use. The battery is also compatible with Ivation’s hedge trimmer and string trimmer so you can use one battery system to handle all your basic yard care maintenance machinery. The end of the hose features a scraper for removing stuck on debris. It is quiet and easy to operate so you can use it in the morning or at night without bothering the neighbors. Ivation has a great customer service team to help troubleshoot any issues you may have. All components are covered by a full 1-year warranty. It can only run for 25 minutes on a full charge. It is designed or small areas such as decks, porches, and sidewalks. If the foliage around your home is too dense or too thick then this unit may not have the velocity necessary to move the debris effectively. The EGO Power product line is designed to last. The company has a good reputation for producing quality engineered products. The EGO POWER + Blower unit was developed using advanced aeronautics technology to engineer their revolutionary turbine fan design. The fan is capable of producing 480 CFM airflow output. This allows this rechargeable blower to outperform many of the gas models on the market. This package includes the battery so you do not need to make an additional purchase before you use this product. This unit uses a 56V 2.5Ah Arc-lithium battery for longer-lasting runtime and it is capable of producing more power. The battery can also be used on all the other EGO POWER product line equipment. The Blower comes with a 5-year warranty and the battery comes with a 3-year warranty. The EGO POWER + Blower weighs only 13.27 pounds. It is cordless and does not need any gas or oil. It features a brushless, high-efficiency motor. This unit has a sturdy weather-resistant construction. It is lightweight, compact and easy to maneuver. It is designed to produce low vibrations for additional comfort if you need to use it for an extended period of time. You have three choices of speeds so it can handle all your landscaping needs. The battery charger automatically shuts off once the unit has a full charge. It does not include any kind of shoulder strap to help support the weight of the unit during operation. The company will only honor the warranty if you purchase it at Home Depot. Replacement batteries are very expensive. The battery will only operate on high for 10 min and 60 min on low speed. 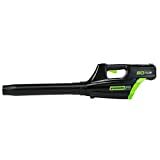 The Snapper XD SXDBL82 Cordless Leaf Blower is extremely lightweight and weighs less than 8 pounds. It has a 130mph velocity with the ability to move up to 550 CFM with ease. It has an 82V lithium-ion battery made by Briggs & Stratton. It also features a blue indicator light that will show you if the unit is powered on. It can accommodate three different models of Briggs & Stratton batteries. There is a brushless high-efficiency motor for longer lasting battery life. The Snapper XD has a handle that is molded to provide comfort. It has an easy start electric button that anyone can use, it features an ergonomic grip and the unit is capable of providing a reliable power output. 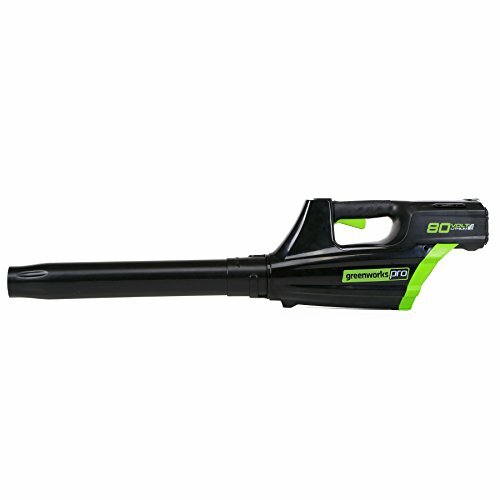 The Snapper XD SXDBL82 Cordless Leaf Blower is lightweight so it is easy to maneuver anywhere around your yard. It has an infinite speed control that will allow you to constantly adjust the airflow so you can easily use it to clear any of your landscaping or flower beds as easily as clearing the yard or driveway. It has an anti-tip base for added stability when not in use. It is easily started with its push button design. A metal tube at the end helps to protect it from cracks or breaks when it comes into contact with the ground. The Battery and charger are not included with this unit, so you will need to make an additional purchase before you can use this leaf blower. The unit does not have a long battery life. You may need to purchase at least two batteries to get the job done so that adds to the expense. The batteries and charger for this unit cost almost twice as much as the blower itself does. It has lightweight construction, made of plastic, so it is more delicate than blowers featuring a heavier duty metal construction. The Makita DUB182 18V LXT Lithium-Ion Cordless Blower is not as powerful as some of the other models reviewed. It has a maximum air velocity of 179 mph an air volume of 91 CFM. It uses a 3.0 Ah 18V LXT lithium-ion battery. It features a three-speed control which makes it easy to use for all kinds of jobs all over your property or at your workplace. This is an extremely lightweight unit that weighs in at less than 4 pounds with the battery attached. This makes it ideal for bringing along with you to job sites, or even when you go camping to clear your area of fallen debris before you set up your tent. It would be an excellent choice for anyone who may have difficulties using the heavier blower models. The recharging unit communicates with a computer chip that monitors temperature, current and voltage. The Star Protection Computer Controls are designed to protect the blower against over-heating, overloading or discharging. The lightweight helps to reduce the fatigue of the operator. The battery can fully charge in just 30 minutes. It is a compact ergonomically designed unit that features a soft-grip, rubberized handle for ease of use and additional comfort. It is very maneuverable due to its small 20.75-inch long tube. The speed switch trigger is in the handle and easily operated with two fingers; it is easily accessible even if you have a gloved hand. This unit can only operate for up to 12 minutes on a full charge before the battery needs to be replaced or you will need to stop and wait a half hour to recharge it. This unit may not satisfy some people because of its very small size. The length of the nozzle may make it difficult for tall people unless you buy an additional tube extension accessory which adds to the cost of the system. The GreenWorks Pro 80V Li-Ion cordless leaf blower is designed to match the power found in a gas-operated commercial leaf blower. It’s eco-friendly because the motor is extremely quiet, operating in the 60-decibel range. It has an air velocity of 125 mph and a capacity to move a volume of 500 CFM. It is powerful enough to tackle both wet and dry leaves. It has a high voltage electric motor for producing maximum power. It operates on an 80V Lithium-Ion battery. The batteries are designed to be able to be removed and replaced very easily by snapping them into and out of place. The lightweight design and an easy push-button starter make it simple for anyone to use. It can easily bee one of the best cordless leaf blower. The unit performs like a more powerful gas-powered model. This engine is very quiet so it is less annoying to the neighbors. There is a wide range of tools you can get that operate on the same battery system, including a hedge trimmer, an 18-inch chainsaw, a lawnmower and a string trimmer. The battery is very easy to put into place. It features an easy-start push button. The battery and charger are not included this increase the cost of the system. The weight and design of the unit are not designed for comfort and prolonged use may hurt your wrist after a while. It has a short battery life. Several customers reported that the unit stopped working in less than a year. The warranty requires you to hand deliver the unit to a company service station that may be far from your home if it does need to be serviced or repaired. The airstream is not too wide so you may need more passes back and forth to get the job completed. After reviewing all of these best cordless leaf blower, the clear winner that stands out from the pack is the GreenWorks Pro 80V Li-Ion cordless leaf blower. This unit is quiet, requires no maintenance, has an easy start button and provides power levels equivalent to those of commercial grade leaf blowers. It has enough airflow to handle the toughest jobs and has great customer satisfaction. 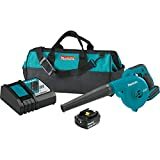 The Makita DUB182 18V LXT Lithium-Ion Cordless Blower did not win because it did not have sufficient battery life, but its small size and light weight would make it the ideal choice for someone who may have difficulties handling the larger blowers. Customers were very satisfied with its overall performance. The Snapper XD SXDBL82 Cordless Leaf Blower featured better airflow capacity than the GreenWorksPro and it was hard to choose between them. The EGO Power was much heavier and did not feature variable speed control. It only has three speeds. The Ivation 20V Electric Cordless Blower just did not perform as well as the other blowers that were reviewed. It was quite like the GreenWorks pro but lacked the significant power the GreeWorks Pro featured. The quiet motor on the Greenworks Pro model was what helped it edge it out above the competition. I hope you liked our review about the best cordless leaf blower.